When Halloween is over, Felina, a young witch girl, finds herself stranded with a broken broom, unable to fly home to her family. She is taken in by the Doons - two parents, their daughter, Lucinda, and their cat, Itchabody - who slowly help her shed her witchy persona and become a sweet and loving human child. This Halloween-themed story was originally published in 1960, and has just been reissued by Simon & Schuster with new cover art, giving it a new lease on life for 2013 readers. Unlike so many holiday titles, this one has a lot of substance and it explores real issues beyond just the whimsy of Halloween night. Though Felina is a witch, and does seem to have magic powers, her story really reads like an allegory of the experience a child might have in a new foster home. Her magical powers and unusual habits can be read as the misbehavior of a child acting out in an uncertain environment, and her ultimate shedding of her witchy identity seems to represent her acceptance of her new family. 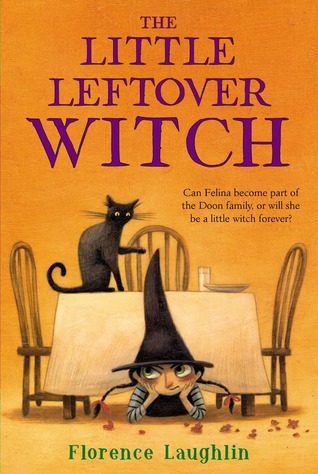 What makes this story work so well is the fact that no one - not Lucinda, who narrates the book, and not any of the adults in her life - questions that Felina is a witch. The fact that everyone just accepts that notion as truth actually contributes to an overall sense of ambiguity that I really enjoyed. If Felina truly is a witch, then the story is fantasy, and the adults in the story live in a world where witches exist and their existence is readily accepted. There is a possibility, though, that Felina is not a witch, and that the adults of the story merely humor her insistence that she is in order to help her settle in to her new situation on her own terms. This sense of ambiguity is helped significantly by the fact that the story is narrated not by Felina, but by Lucinda, her foster sister. Lucinda’s childlike outlook makes it perfectly plausible that Felina is a witch, but also makes it equally possible that Felina’s magic powers have been invented to explain her strange behavior as she adjusts to her new family. I might be reading more into this book than is intended, and I don’t think it’s necessary to adopt my reading to enjoy the story. It works very well as a fantasy tale, and I think young readers who have liked reading about Mildred Hubble in the Worst Witch series, and those who have enjoyed Lulu Goes to Witch School will be delighted to make friends with another witch and to follow the story of how she is ultimately adopted into a human family. Some kids - and I might have been one of them - will wonder why Felina is never returned to her witch family, and why she doesn’t seem to miss them. I could even see some critics possibly complaining that it’s unfair or somehow judgmental to favor the love of a human family over the love of a witch family, but that would really be taking things too far. In my opinion, this is a charming chapter book that will be enjoyed at Halloween and all year round by girls ages 6 to 9.